The ThINKin' Spot: Peachy Keen Challenge #33 & A HUGE Sale! Peachy Keen Challenge #33 & A HUGE Sale! Hello and HAPPY FRIDAY!!! With a three day weekend upon us, I can imagine that many of you are celebrating big. Hopefully you have some fun things planned, and maybe even some stamping, too. 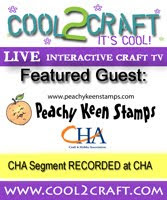 If stamping IS on your agenda, then why not join us for Peachy Keen Challenge #33? With the chance to win a fabulous prize, be one of those honored with the top 3 spot, OR possibly even making Top Peach, there's LOTS of incentive for playing along. This challenge couldn't be any easier, either, because it's an "ANYTHING GOES" challenge. You don't have to use Peachy Keen Stamps to play along, but to be considered for one of the top 3 spots, or Top Peach, using PKS is a requirement. Are you ready for our BIGGEST SALE EVER?! Have a wonderful day and a very blessed and beautiful Labor Day Weekend! So cute. Your colouring is amazing my friend. Gorgeous tag, Lorie! Darling paintbrush image and so beautifully colored too!! Hugs!!! So, so cute! I love the colors you used and all the wonderful embellisments:)Thanks for the inspiration! Wow, this tag is fantastic! Love the ribbon and colors, the image is too cute. Very nicely done! Stunning card. So lovely design. How can i learn designing like this for the Membership card printing? I like it. Cottage Cutz Happy Wedding Day! School's In Session -- Hip Hip Hooray!